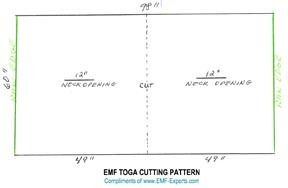 EMF Clothing can be pricey, there is no way around it due to the complicated metal based fabric construction, however we've found an easy way to keep the costs to a minimum simply by buying the fabric yourself and fashioning this No-Sew EMF Toga Coverup for everyday casual wear over your normal clothing. 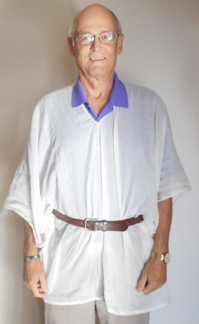 Worn with a belt for a form fit (we call it the Luke Skywalker look), or without a belt for a more cape-like fit (the Caftan look), you simply pull it over your head, one size fits all. Either way you wear it you achieve the highest possible skin-friendly EMF personal protection and the lowest possible cost. Find the free, easy cutting pattern below. This translucent, white or ecru (unbleached) eco fabric is so skin compatible and finely woven it can be used for baby clothes, yet it offers a good amount of radio frequency shielding (from such wireless devices as WiFi, Bluetooth, cordless phones, cellphone and cell towers, microwave leakage , TV broadcast, etc). When purchasing using this order form, simply change the quantity to 5 on the order page, which will order five linear feet for this toga garment. If you want to have the fabric on a roll (not shipping as folded fabric) you will need to add the rolling charge to your shopping cart as a separate item as well. EMF clothing does not come in a more skin compatible fabric, certified to contain no harmful or toxic substances and no flame retardants. 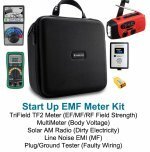 Typical application includes EMF clothing, bed canopies, semi sheer curtains, however it is so “people friendly” it has also been used for EMF-shielding under garments, even so far as being used in baby’s underwear. To give it RF blocking properties, extremely thin copper wires have been coated with silver then encircled with eco-cotton yarn. The threads are then woven into washable, comfortable, and durable fabric with the look and feel of normal fabric material. The metal on the inside of the cotton fiber contributes to more durability, thus making it particularly easy to wash, iron, cut and sew. This extremely wide 98" fabric (ordered in a 5 ft length) will be cut in half to create two 49” panels, resulting in two EMF Togas that measure 49" long by 60" wide. These two 4 ft by 5' panels are most cost optimizing use of fabric, with the added advantage that this gives you one toga to wear, while one is in the wash. 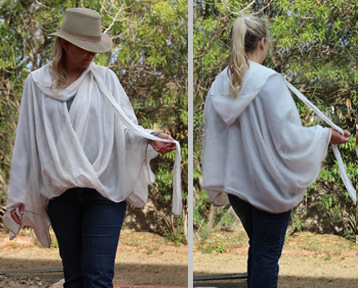 Step by step instruction sheet with easy (complete beginner level) cutting pattern, with tips and optional toga and scarf combination. Total project time 10 - 20 minutes. Download Now. Looking for EMF Protective Clothing that is a little more stylish? 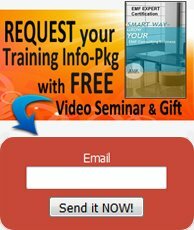 You'll enjoy taking a look at our own designer line - EMF SmartWear - high personal protection EMF Apparel created with eco responsible and skin comfy fabrics, that are also MCS (multiple chemical sensitivity) friendly, and certified to contain no harmful or toxic substances and no flame retardants.